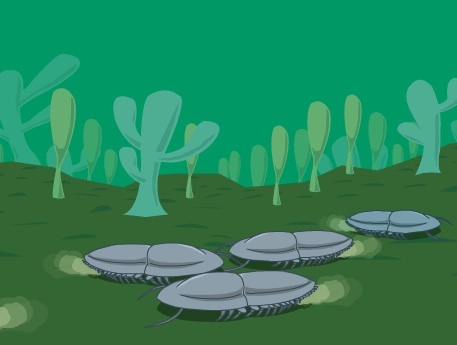 Naraoia (nuh-ROY-uh) was a soft-shelled trilobite-like animal with a posterior shield and an anterior shield. 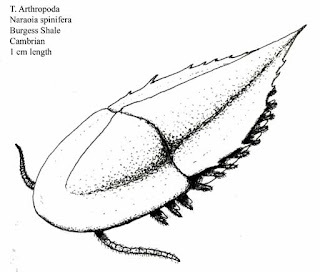 Walcott described Naraoia as a crustacean because of its large carapace. 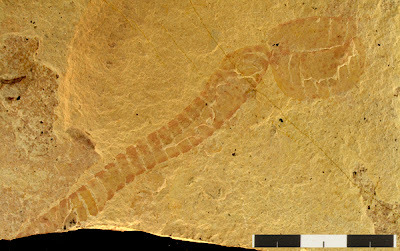 But now it is believed to be a trilobite-like animal because scientists know that it had soft parts under the carapace. Even though Naraoia could swim for a very short period of time, its armor was too heavy to allow Naraoia to swim for very long. 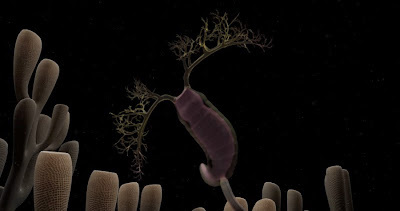 Naraoia probably crawled along the sea floor in search of prey. 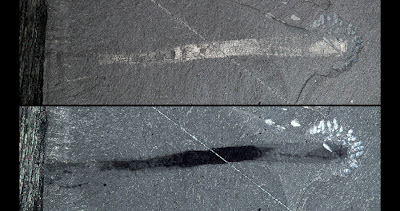 Some specimens of Naraoia show bite marks, so it was probably good prey for predators such as anomalocarids. 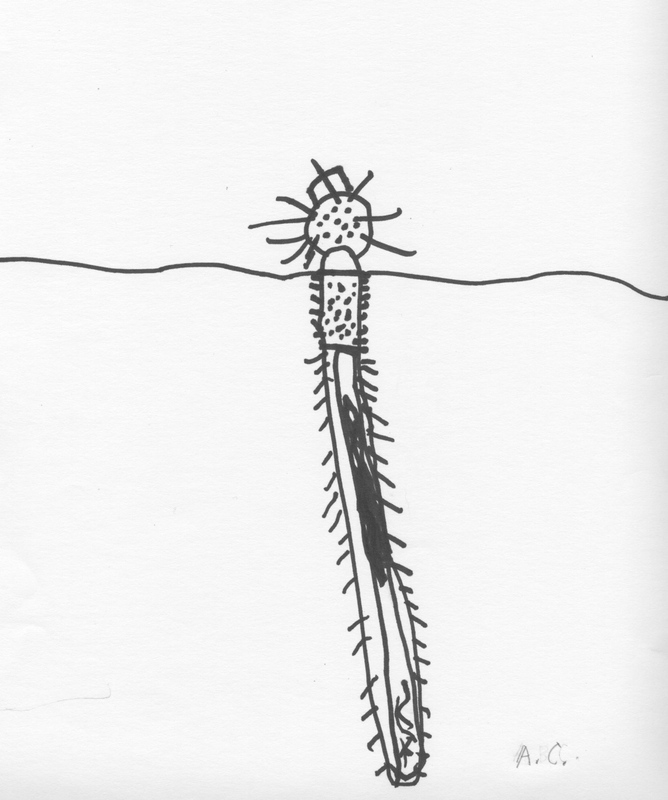 Naraoia could be up to 4 cm long. 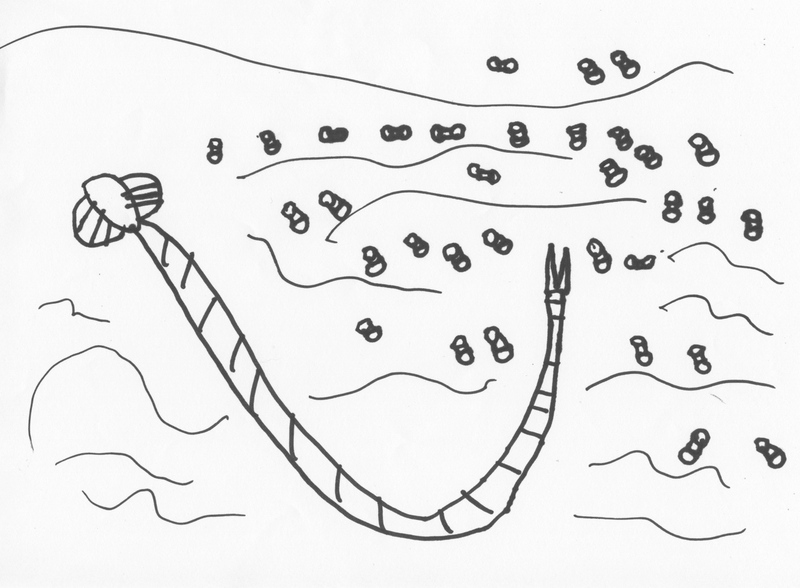 Click the image to see Naraoia crawl across the sea floor. 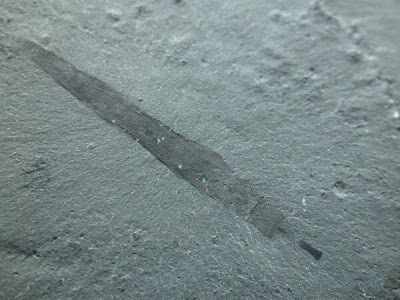 This fossil of N. compacta is one of the best preserved Burgess Shale fossils. 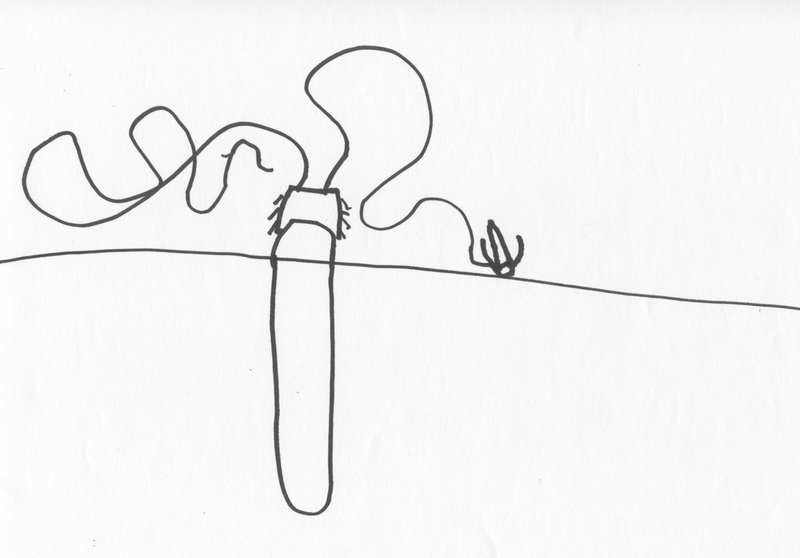 It's a complete specimen and has well-preserved appendages. 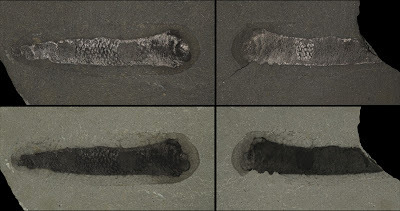 According to Stephen Jay Gould, it can be photographed unretouched, unlike most other Burgess Shale fossils. 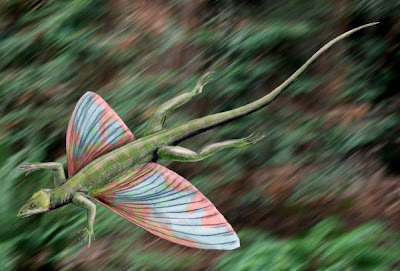 Coelurosauravus (see-low-row-SORE-uh-vus (or) see-lore-oh-SORE-ay-vus) was a genus of late Permian reptile with "wings" that were either for gliding or display. 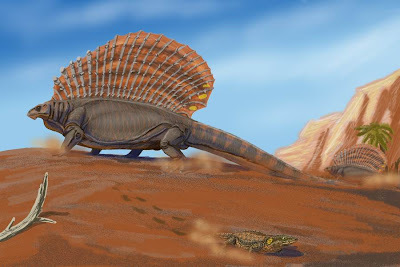 It was very similar to the Triassic kuehneosaurids, but unlike the kuehneosaurids, it had a crest, like the crest of the dinosaur Protoceratops. Coelurosauravus's wings resembled those of a moth, but they were made of stretched out bones covered with skin. 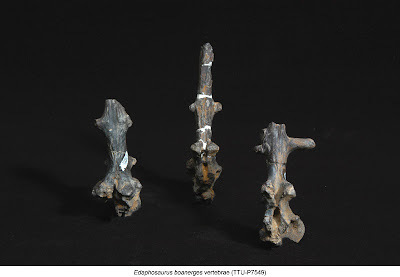 Coelurosauravus had sharp claws used for climbing tree bark. 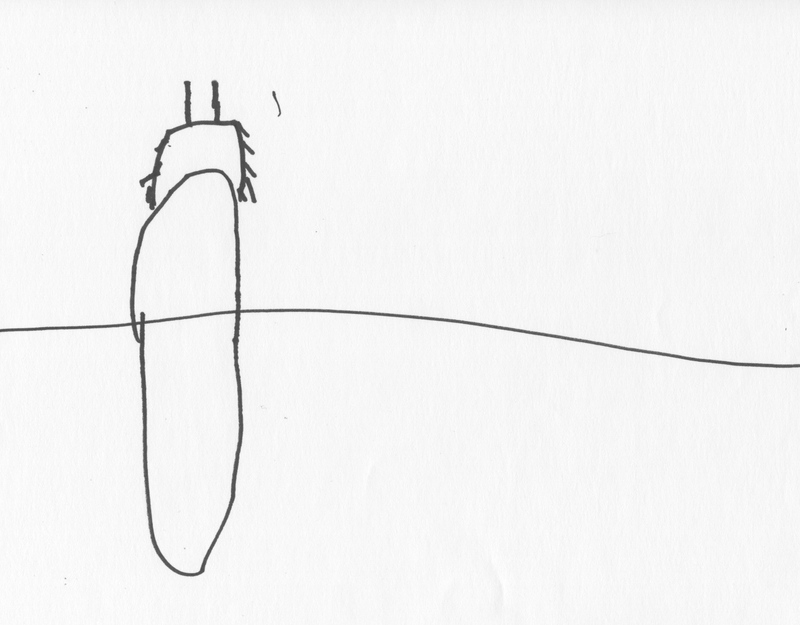 It was about 16 inches long. 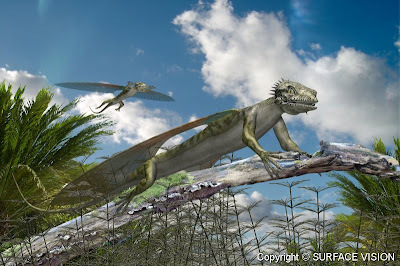 Coelurosauravus probably ate flying insects like palaeodictyopterans. 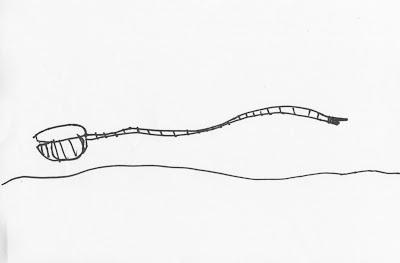 It was the first reptile to "fly." 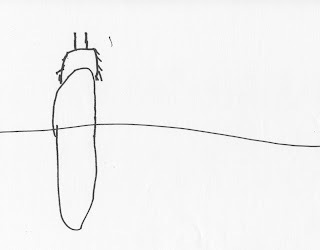 It could only glide, because it didn't have muscles in its wings which would allow it to actually flap them. 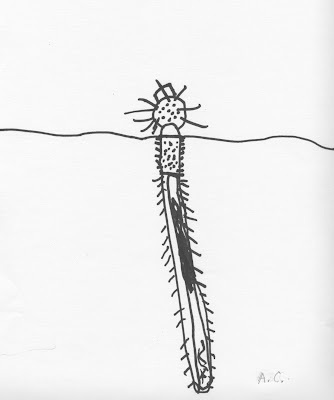 Facivermis is a peculiar genus of Cambrian worm which had ten prickly arms, five on each side of the head area. 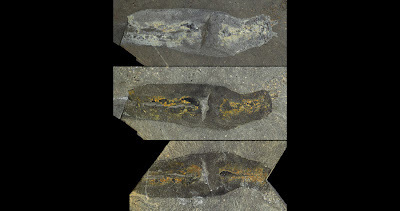 Fossils of Facivermis are rare and are found in China. 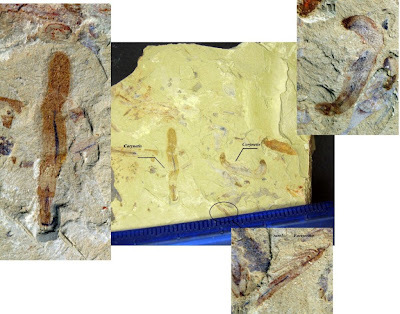 The image below shows a fossil with many specimens of the spiny worm Corynetis brevis and one Facivermis yunnanicus. 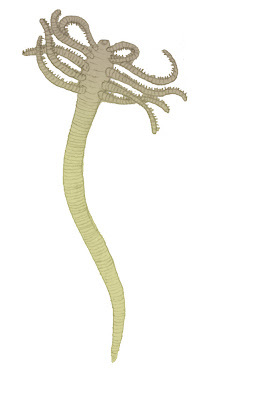 In this fossil, Facivermis is holding its ten arms against its body, possibly so they wouldn't get in the way of burrowing. Facivermis may have used its arms to grab prey, but that's just my hypothesis. 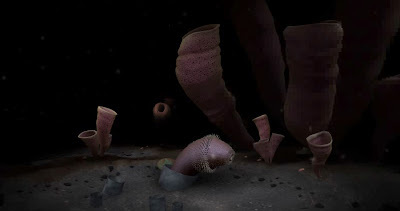 Selkirkia is a Cambrian priapulid worm which has been found in the Burgess Shale in Canada, and in Utah and China. 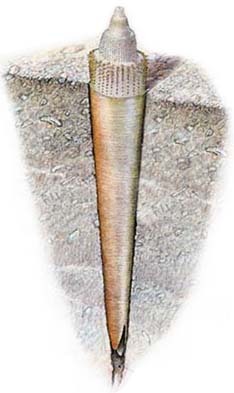 Selkirkia lived in a cone-shaped tube which had a split at the end. 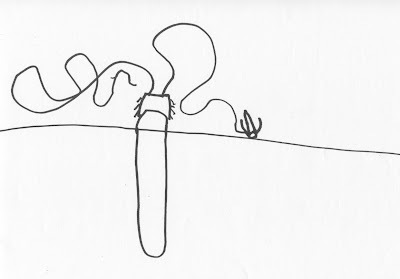 This split was the opening that would have allowed feces to go out of the tube. 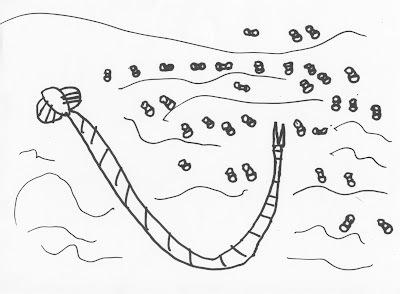 If it did not have the split, feces would have built up inside the tube and eventually poisoned Selkirkia, then killed it. But that's just my hypothesis. 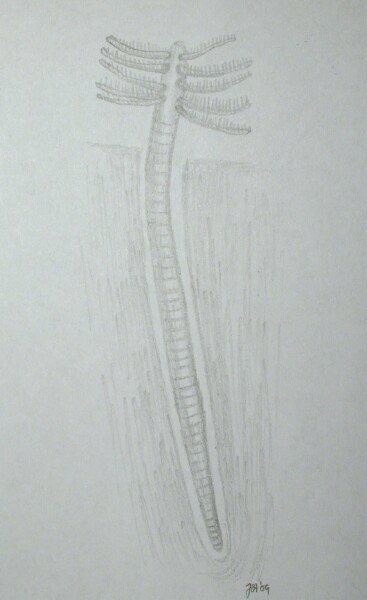 When Selkirkia died and rotted away, agnostid trilobites dug up the tube and then sheltered in it. 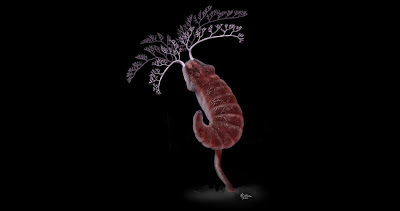 Scientists know that because some specimens of Selkirkia's tube have agnostids in them. 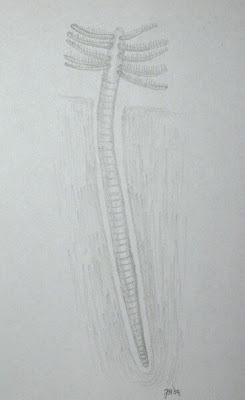 The tubes inhabited by agnostids are horizontal, but the tubes with Selkirkia still in them are vertical in the rock. 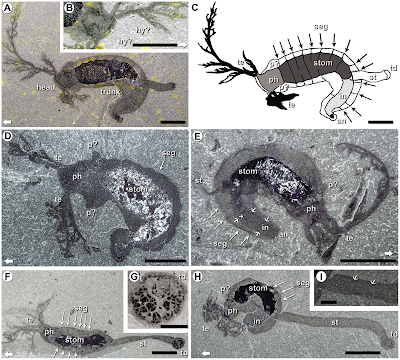 Selkirkia was very similar to its relative Paraselkirkia, but there was one huge difference between the two. 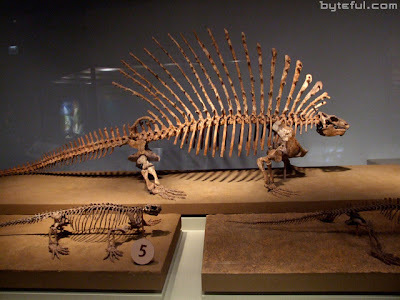 Paraselkirkia had a ring of spines on the head that were pointing backwards. Selkirkia did not have this.